UrBanPerspectiV BLOG: Pool Tea or Me ? 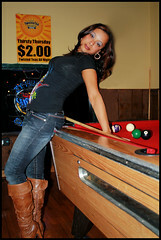 Another one of those images I snapped from that hard nite's work at the Calendar Model Search at Scruffy's Lounge in NE Philly . If you're a new follower, whether from my Facebook page, or Twitter, or even BLOGGER, be sure to click the color links within this post to see even more images from that evening's shoot.